Buko Pandan is a refreshing Filipino dessert made from coconut, pandan gelatin, tapioca and milk. It is best served cold which makes it perfect for eating in the summer and during special occasions when people want some sweet dessert their meal. Commonly known as tapioca pearls, pearls or boba, they are typically made from cassava root tubers that are associated with yams. When the tapioca starch is extracted from the cassava, they are made into balls and are subsequently made into pearls. There are several ways to serve pearls and the most popular kind is to serve them with syrup. When soaked in syrup and/or honey, the pearl coating turns black and this is what accompanies iced milk tea. Buko Pandan, on the other hand, uses mini boba to add to the chewiness of the coconut meat and gelatin. Mini boba is half the size of regular boba and can be unsweetened. This is because the milk mixture will flavor the boba once all the ingredients of the Buko Pandan are combined. 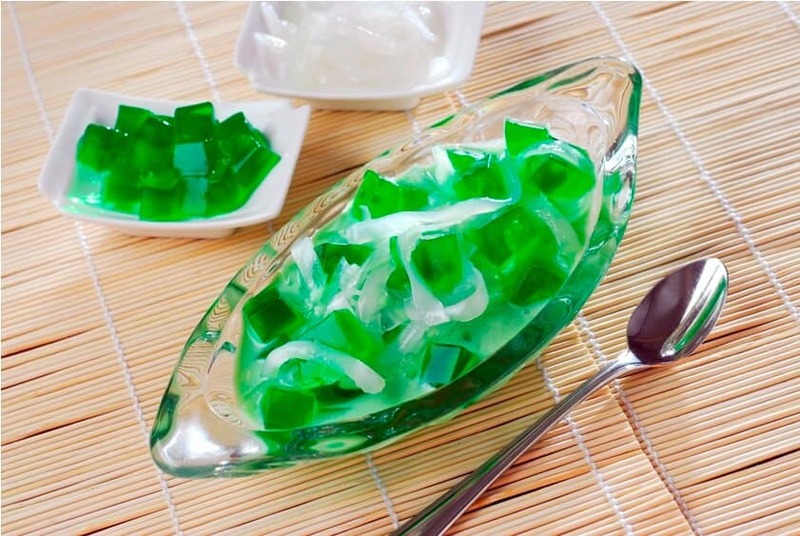 A quick and easy way to make Buko Pandan is to buy or order pre-made gelatin. However, if you want everything consistently homemade, we have a recipe for both plain and flavored gelatin below. Agar-agar is a jelly-like substance made from algae and a perfect vegetarian/vegan alternative to gelatin. Gelatin is defined as a soluble protein made from animal ligaments and is usually water-soluble. Consistent with the Buko Pandan flavor, the gelatin or agar-agar will have a strong taste, if at all scent, of coconut and pandan extract that goes with the milk, pearls and coconut shreddings. Similar to the aroma of jasmine rice and coconut, pandan has a signature aroma and taste that is distinctly from the South Asian region. 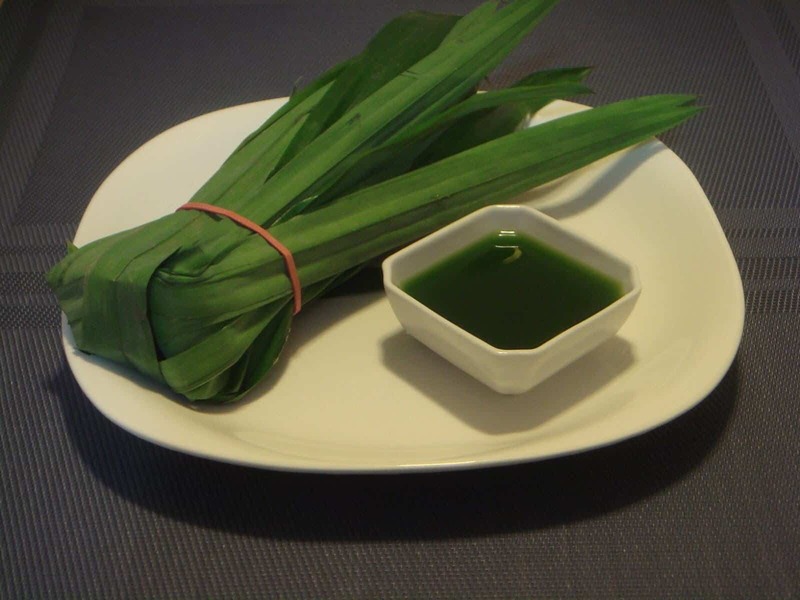 Both the pandan leaves and extract are used in this recipe – but not too much so as to overwhelm the milk or the gelatin. 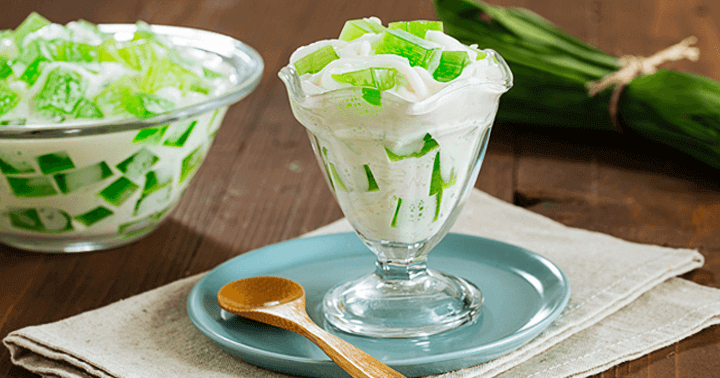 When served with buko pandan, coconut meat provides the nutritional value of the dessert. 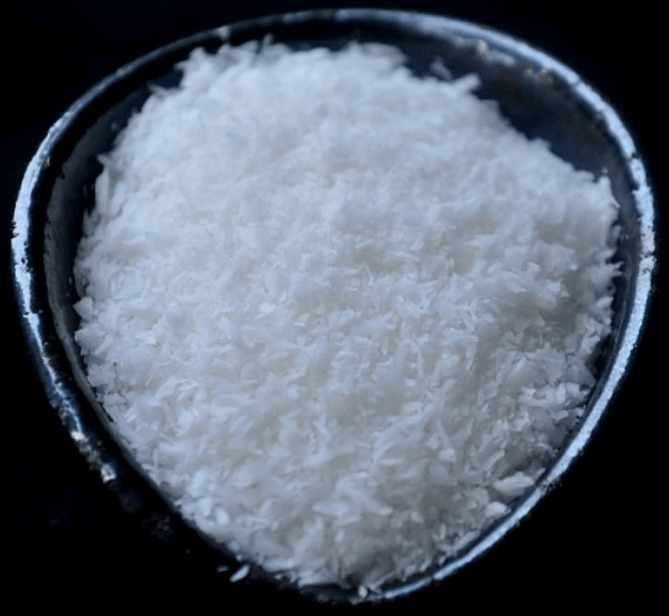 There are kinds of variations used: shredded coconut, fresh coconut and coconut shavings. 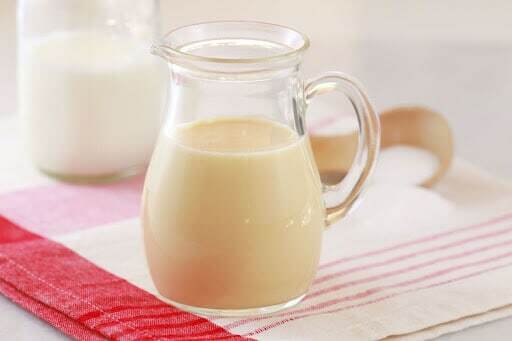 The milk used in this recipe can be fresh milk, evaporated milk, condensed milk or coconut milk. All of which are a balance to the level of sweetness coming from the pandan. Sweet blends of vanilla, sugar and pandan extract are used for added flavor. This recipe has both gelatin and tapioca that are prepared before the dessert is assembled together. The earlier you make these ingredients, the chewier and firmer they would be and they become an excellent addition to the Buko Pandan’s texture. 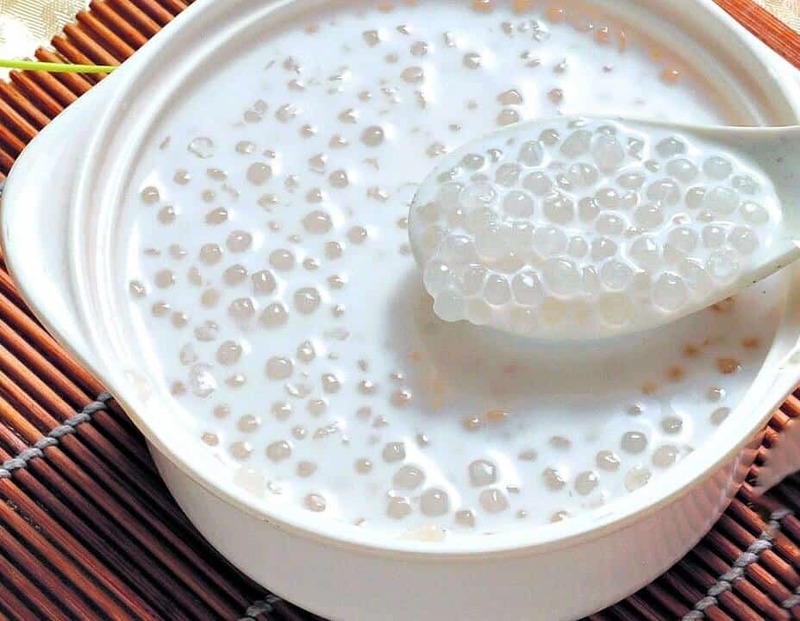 Gelatin is ideally made 3 to 6 hours before cooking and tapioca pearls, a day before. Step 1: Add water and 1 bag or .70g of agar agar powder to the saucepan. Step 2: Turn the mixture to medium to high heat until the water boils and whisk the mixture constantly. Step 3: See if the mixture is boiling and if the powder is dissolved, you can then add sugar and then turn down the heat to low and cook for two minutes. Tip: Adding the sugar before boiling will not dissolve the powder. Step 4: Remove the pan from the stove and transfer into a 8” x 8” (20 x 20 cm) baking dish or a container of a similar size. Step 5: Allow the gelatin to cool in the refrigerator for 20 minutes and afterwards, cut them into half inch cubes. Store them again in the fridge until the buko pandan is ready to be prepared. Step 1: Fill a medium-sized pan with water and in it, put the 3 to 4 pieces of knotted pandan leaves along with 2 tbsp of pandan paste and 2 tbsp of sugar and bring the mixture to a boil. Step 2: Mix 1 package or 1/4 ounce of gelatin powder into the pan and stir well until the powder is dissolved. Step 3: Pour pandan mixture into a baking tray or plastic container and leave to chill in the refrigerator for at least an hour. Step 4: Cut into half-inch cubes and store it again in the refrigerator until it is time to assemble. Step 1: Boil two cups of water in a saucepan. Step 2: When the water starts boiling, add the tapioca pearls and keep stirring the pearls with a spoon to prevent them from sticking to the pan. Step 3: Strain the tapioca pearls and let it cool. Set aside until dessert is ready to be assembled. Step 1: Prepare the gelatin based on instructions or based on the recipes of tapioca and gelatin as demonstrated above. Refrigerate the gelatin for 60 minutes or until it is ready to assemble. Set aside the mini tapioca balls in room temperature. Step 2: Cut the 2 bags or 2 cups of shredded coconut into smaller pieces. Tip: If you want the coconut toppings to be thicker, use sliced fresh coconuts. Step 3: Mix 1 can of sweetened condensed milk and 1 can of evaporated milk in a bowl. Add the 4 cups of cut coconut, 2/3 cups of mini pearls and 2/3 cups of gelatin and continue mixing. After everything is incorporated, transfer to a refrigerator-safe container where it can chill for about an hour and served in small bowls. Makes for 4 to 6 large servings. Even with what appears to be many ingredients, making Buko Pandan without one of them would not ruin your experience. It all depends on the availability and sometimes when you do not have a particular ingredient at hand, it should not ruin your experience. Try the different ways of incorporating the above food items in different ways. For example, you can use the coconut in the gelatin instead of in the milk or as shredded coconut. 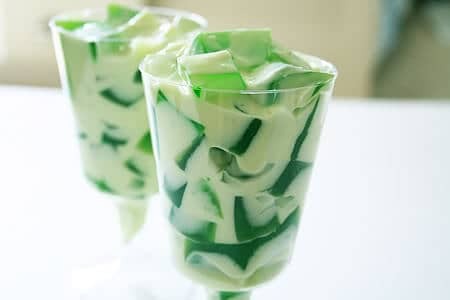 In this way, you would know how much coconut or pandan or gelatin would suit your taste. The possibilities are endless.